The benefits and blessings of Iftar Dua; Dua for Iftar are too many to be counted. Iftar Dua is also called “Roza Kholne ki dua“and “iftari ki dua“. If one does realize its exact importance and meaning, then he/she will wish to have the month of Ramadan, throughout the year. Allah Almighty provides a lot of blessings, rewards, and benefits to all those Muslims who fast with full expectations and full faith. We should be profoundly thankful to Allah Almighty for all these blessings and also for the month of Ramadan because it is very much unique and essential for every Muslim. 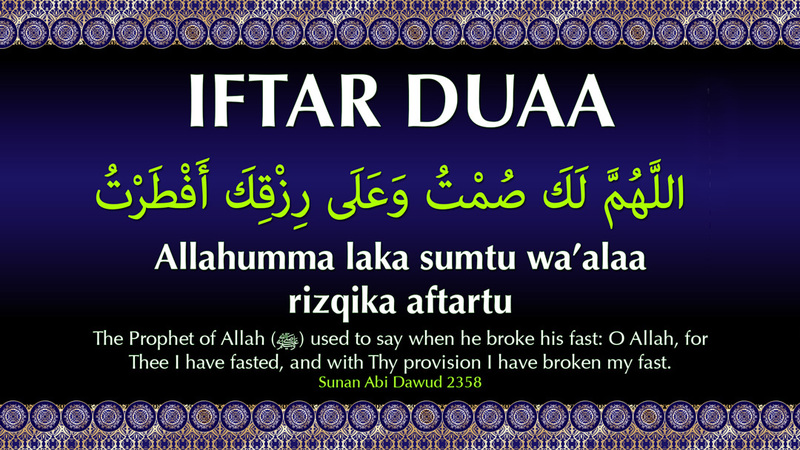 Here I have added Iftar Dua just to help you in learning it. The doors of heaven are open during Ramadan. Doors of Hell are closed. All the devils are chained down during the holy month of Ramadan. Allah Almighty forgives those​ who spend this month with respect and dignity towards Allah. Allah Almighty forgives all the sins during this holy month. There are main two types of the best rejoices for all the Muslims who fast for Allah. The Kindness, Good Deeds, visitation, and hospitality all of these things and much more are among the benefits of Dua in Ramadan. The smell of the mouth of the Muslim who is fasting will be 100 times better than the smell of musk during the day of Judgement. Always ask Allah’s forgiveness, Allah’s blessings, Allah’s love and affection and every Halal thing that you want from Allah after every Iftar Dua during Ramadan – He will surely listen to you and grant your wishes because he is the most Compassionate and The Merciful.